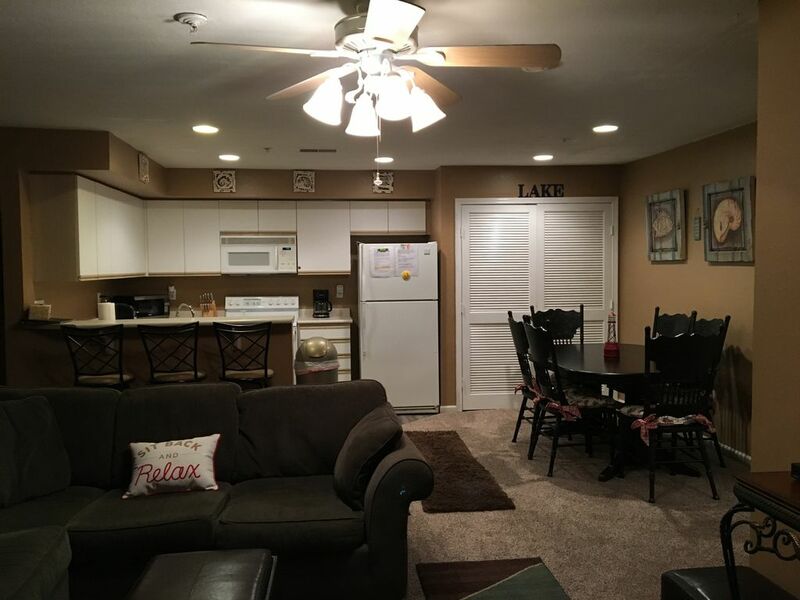 Your home away from home awaits you at our Table Rock Lakefront Condo! Come, enjoy and relax at our family-oriented vacation rental at a beautiful resort--Ozark Mountain Resort in Kimberling City Missouri. The resort is located in a quiet cove on Table Rock Lake. Enjoy a quiet and tranquil setting on the lake. Restaurants and grocery stores are only a 5 minute drive away. Branson is a short drive away where you can enjoy water and amusement parks, live shows, shopping and more! The kitchen is fully stocked with eating and cooking utensils, paper towels, dishwasher and dish soap, trash bags, coffee and other condiments, and a washer and dryer with laundry soap and dryer fabric softener. The dining area offers a table to seat 6. There is a gas grill on the deck. Please note: No Charcoal Grills are allowed at this condo unit. The living room offers a couch (not a sleeper), love seat, flat screen TV, games, DVD collection and a DVD player. A collection of magazines and books are available for your use. The bathrooms are equipped with toilet paper, shampoo, baby shampoo, conditioner, bath and hand soap, hand cream, bath towels, hand towels, wash clothes and hair dryer. The master bedroom offers a queen bed, dresser, closet, linens and TV. The master bathroom includes a double sink and a jetted tub. The second bedroom has 2 queen beds, dresser, linens and closet. Wireless internet is available in the unit as well as the resort activity center. The unit is approximately 900 square feet and 31 steps down to access. There are no elevators at the resort. We loved our 3 night stay! Everything we needed and more was provided. It was clean, quiet, peaceful and relaxing. Perfection. Thanks, Kim! What a perfect spot for our family trip! This condo was absolutely perfect for our family vacation over Thanksgiving. I really appreciated all of the little details Kim added to her condo to make our stay extra enjoyable! This condo has an adorable lake house theme and has a beautiful view of the lake in the morning. Thank you Kim for providing a great place to stay! The condo was very nice and clean. It had everything we needed. It was perfect for my family. We would have problem using this rental again. Thanks Kim! Our family rented Kim’s condo as part of a family reunion. It was so nice to sit out on the deck and have coffee in the morning. There were just enough trees to keep the hot sun away during coffee. In the evening the deck was shaded and a great place to grill! The beds were very comfortable! We slept better than we had in a long time. The kitchen was well stocked with all of the cooking items we needed. The coffee and condiments provided were a wonderful touch! Thanks Kim, we will be back in the future!